IMPACT’S Making an IMPACT Initiative Celebrates the Second Half of 2017 - IMPACT Pharmaceutical Services, Inc. 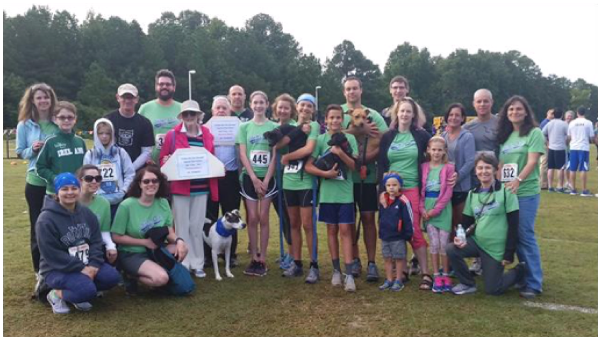 In September, Erin Peters organized a group of IMPACT employees and their families to participate in the “Strike Out Sarcoma” 8th annual 5K and family fun walk. The event was in partnership with the Duke Cancer Institute’s multidisciplinary team: a group of doctors and scientists who are committed to finding life-saving treatments for sarcoma. In addition to walking, IMPACT raised $1,435 to support Strike out Sarcoma! Also in September, Chrissy Cierpial and Lori Davis partnered with Sheridon Jones from Pharm-Olam to bring together a blood drive for the American Red Cross. 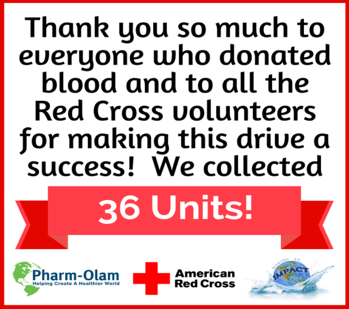 IMPACT and Pharm-Olam employees collected 36 pints of blood at the drive! 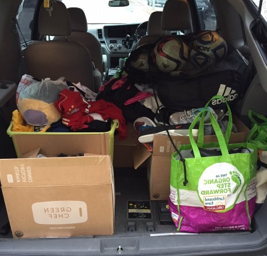 In October, Meredith Latino organized a drive for DonateSport.org, a nonprofit charity that helps kids around the world with the gift of sports clothing and equipment. In addition, EMPOWER Personalized Fitness in Durham partnered with IMPACT to support this drive by acting as a donation site! IMPACT is very thankful for local organizations such as these for their teamwork in supporting our community service initiatives! In November, Nancy Gasper-Smith organized her 4th annual toy drive for Toys for Tots, a US Marine Corps program that collects and distributes new toys as Christmas gifts to children in need. The primary goal of Toys for Tots is to deliver a message of hope and encouragement to less fortunate youngsters that will assist them in becoming responsible, productive, and patriotic citizens. 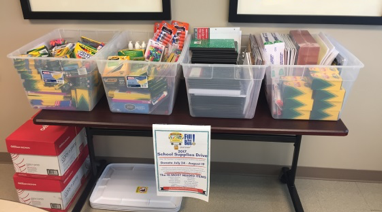 IMPACT employees, along with other tenants in our office building, filled two bins with toys that Nancy brought to the US Navy & Marine Corps Reserves in Raleigh! 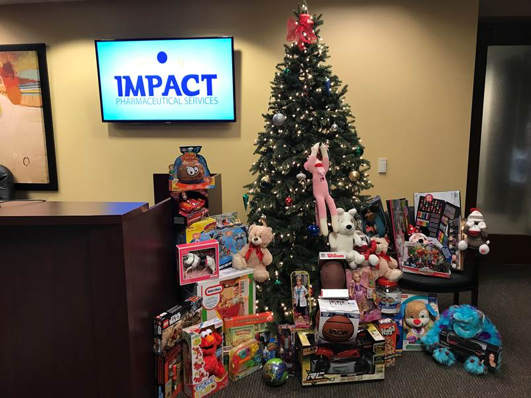 In December, IMPACT hosted its 2nd annual Season of Giving! 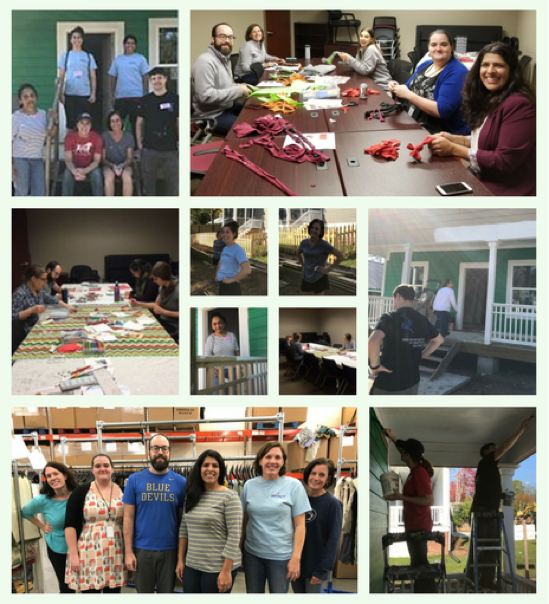 A series of events were held on or off site throughout the holiday season to present IMPACT team members with the opportunity to donate their time during the workday and give back to the community. The Season of Giving kicked off with a joint event between Making an IMPACT and IMPACT on Health: a build day for Habitat for Humanity, which partners with communities all over the world to help build or improve places for people to call home. We had a great turnout and spent an entire day painting this green house (left)! As part of the Making an IMPACT initiative, IMPACT employees come together as a team for larger community projects several times a year. Projects are chosen based on charities or efforts that have strong connections to IMPACT employees and their families. 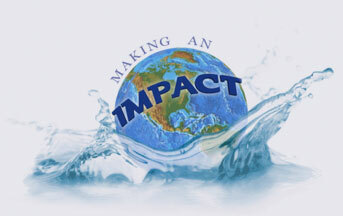 In addition, IMPACT supports and promotes their employees’ efforts to give back to their community by providing them 4 hours of paid time off per month to pursue volunteer work.